Always begin with lighter exercises and build up intensity over time. 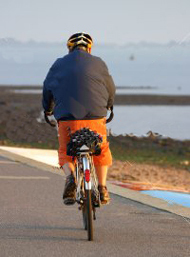 If you are very overweight, have not exercised for a long time or have a medical condition, consult a doctor first. If you are fairly fit, use the FITT formula as your guide. F - FREQUENCY Exercise 3-5 times a week, evenly spaced out. I - INTENSITY Exercise till you sweat and breathe deeply without discomfort or until you reach 60-90% of your maximum heart rate (MHR). This is your "target heart rate". T - TYPE OF EXERCISE Do both aerobic and calisthenics exercises. To estimate your maximum heart rate, subtract your age from 220, e.g. if you are 35 years, your MHR is 220-35 beats per minute (bpm) = 185bpm. To determine heart rate (in bpm or beats per minute), stop exercising and take your pulse immediately. As soon as you stop exercising quickly place the tips of your 2nd and 3rd or 3rd and 4th fingers lightly over the blood vessel in your neck, just right or left of your Adam's apple. Or on the inside of your wrist, just below the base of your thumb. Count your pulse for 10 seconds and multiply by 6. If your pulse is below your target rate, continue to exercise a little harder and retake your pulse later. If it is above, exercise a little easier. If it is within the target rate, you're doing fine.